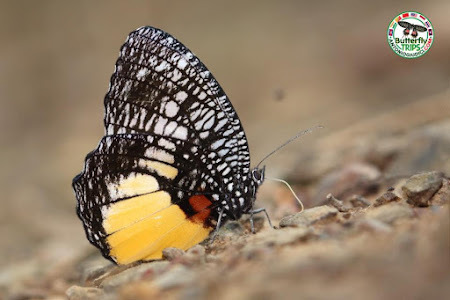 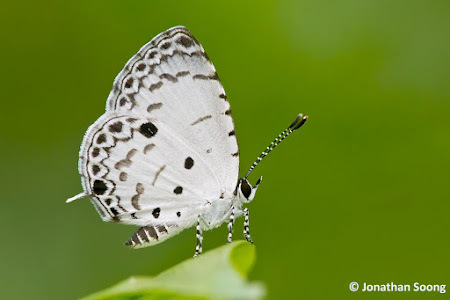 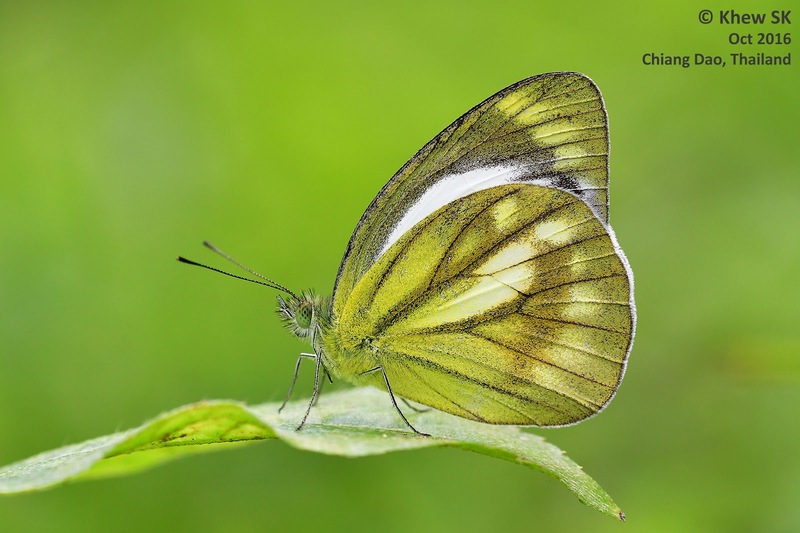 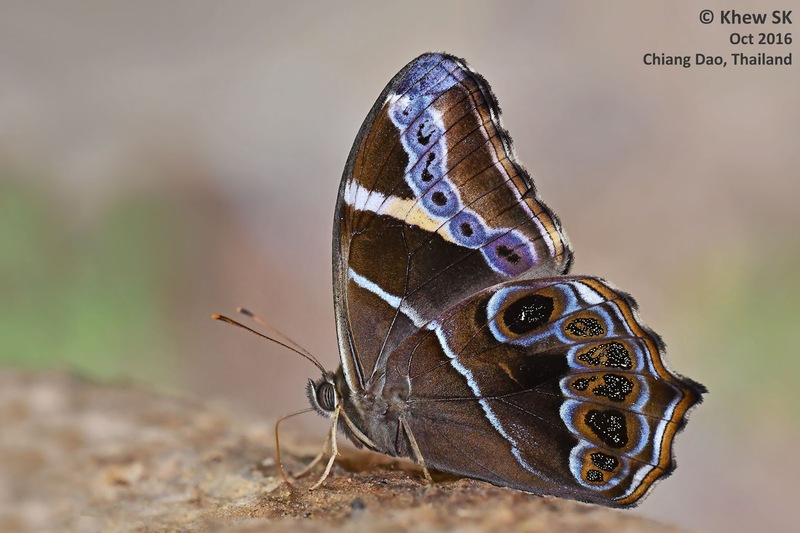 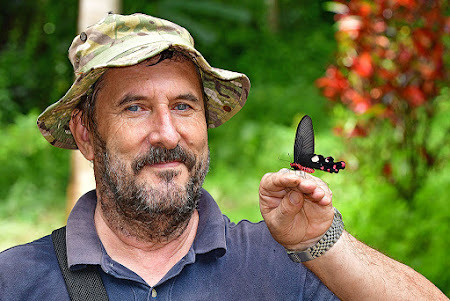 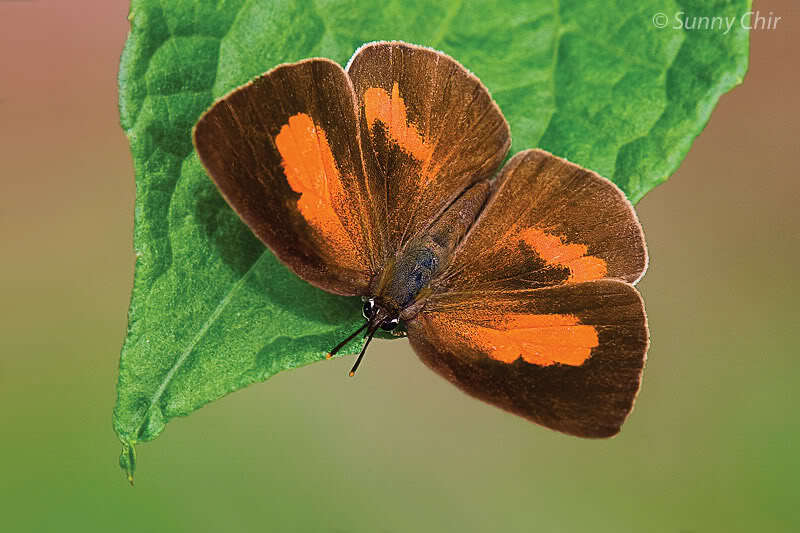 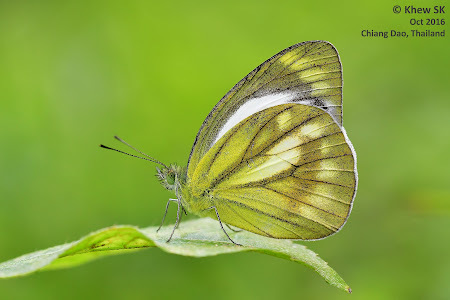 This article features three small butterflies from the subfamily Polyommatinae. Collectively called "Grass Blues", these species are small, feeble but erratic flyers with forewing lengths ranging between 8mm to 16mm. 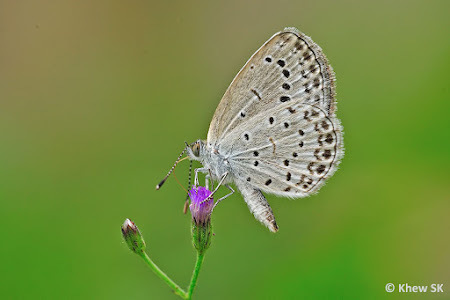 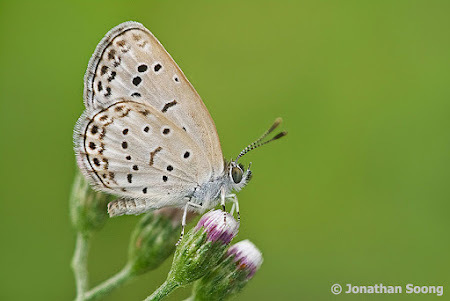 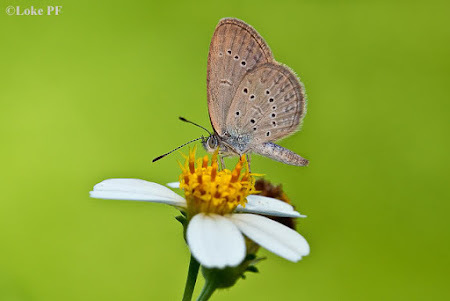 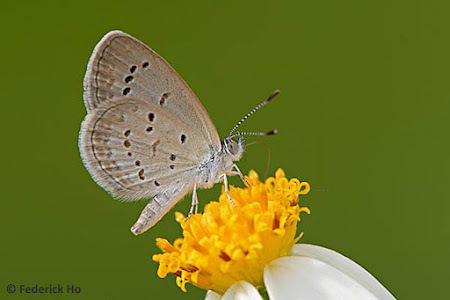 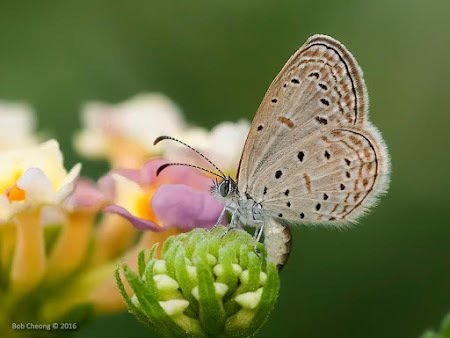 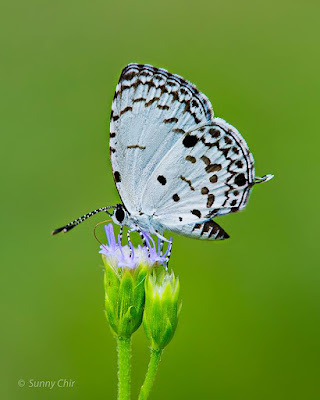 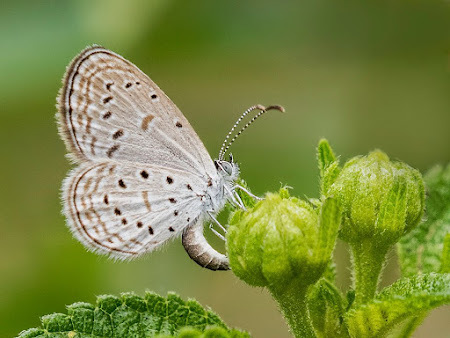 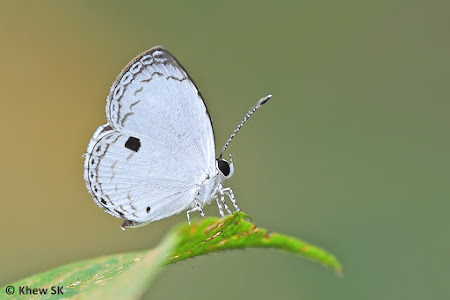 All three are usually observed in urban parks and gardens, and may be considered common, perhaps with the exception of the Pale Grass Blue, which is less often observed than the other two species. The Grass Blues that are currently extant in Singapore actually belong to three different genera - Zizina, Zizula and Zizeeria. 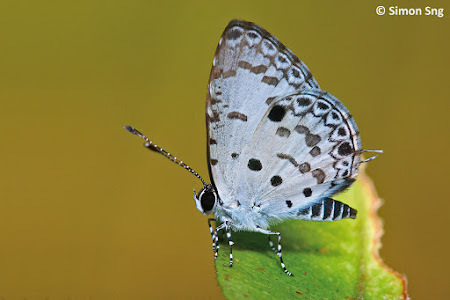 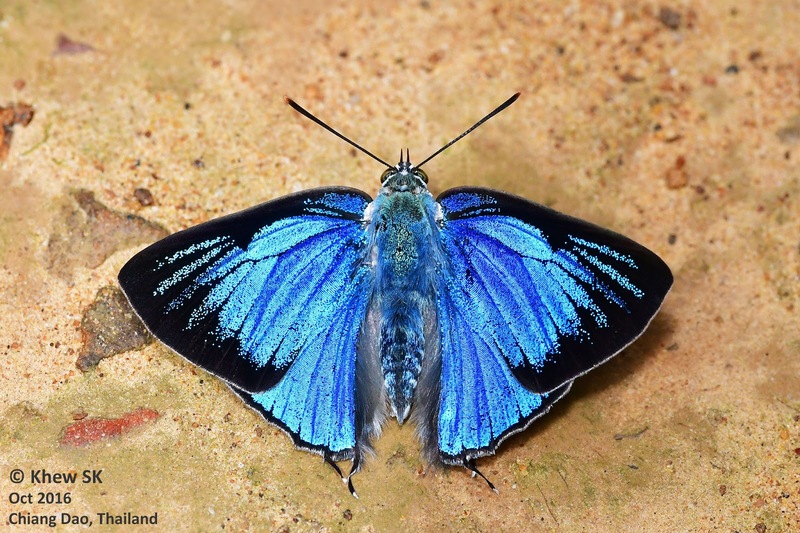 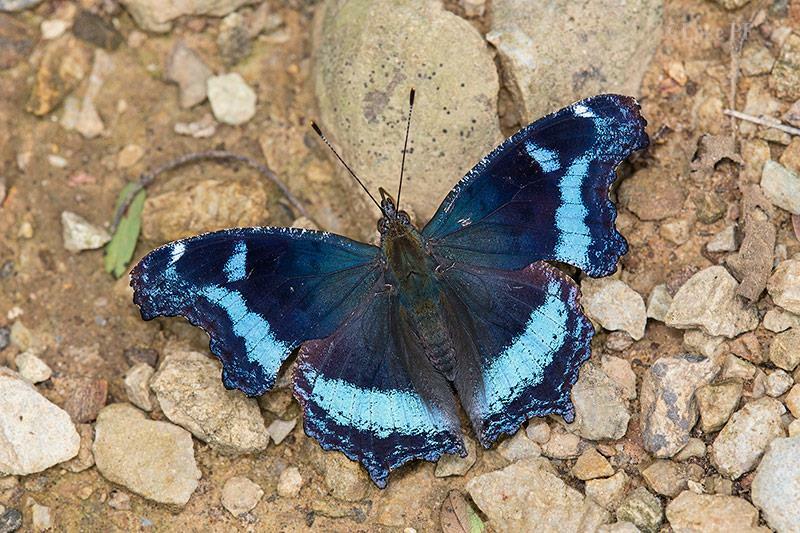 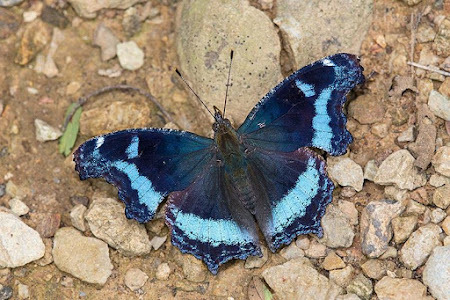 From historical records, a fourth species was known to exist in Singapore - The Dark Grass Blue (Zizeeria karsandra). 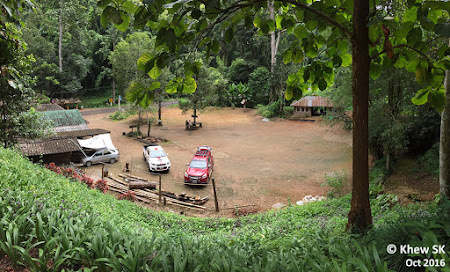 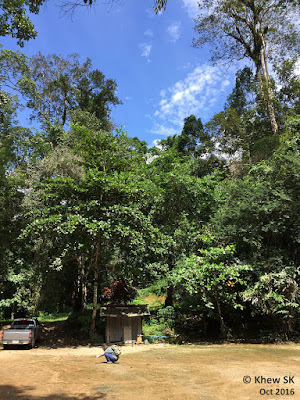 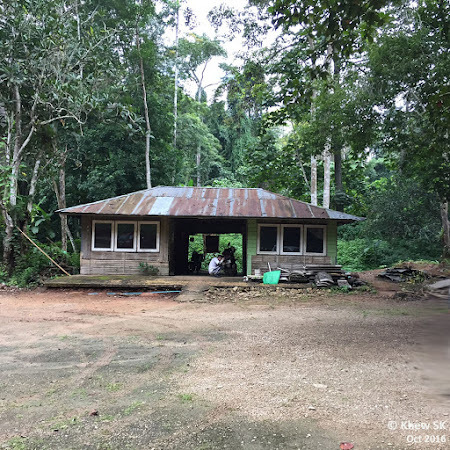 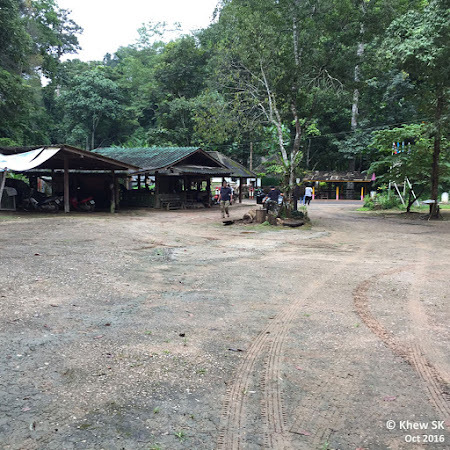 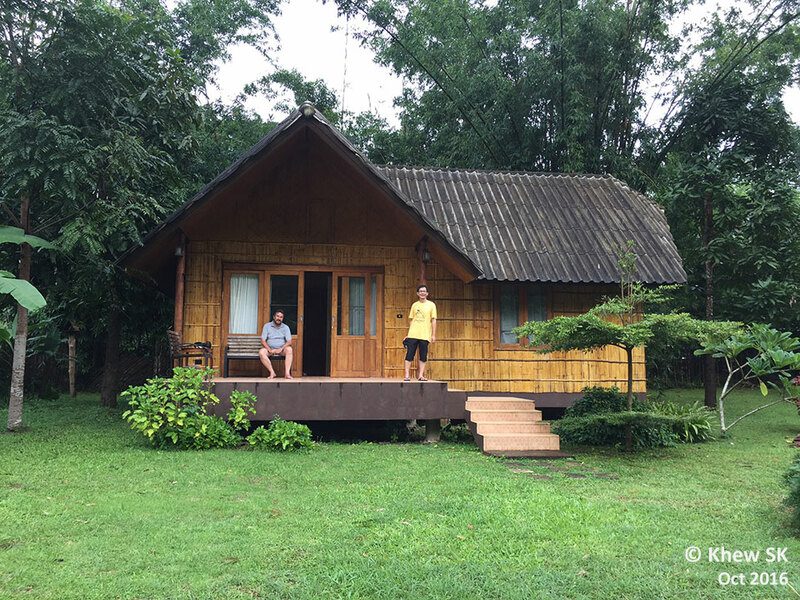 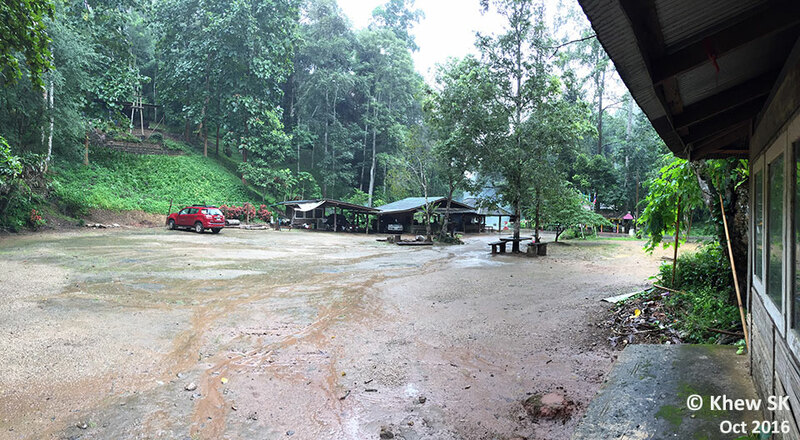 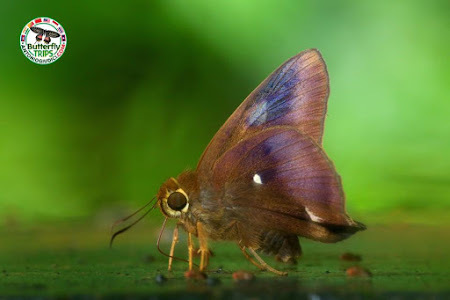 However, this species has not been observed in Singapore for over 20 years and is likely to be extinct, although its presence should continue to be looked out for. Of the three species, the Lesser Grass Blue (Zizina otis lampa) may be considered the commonest. 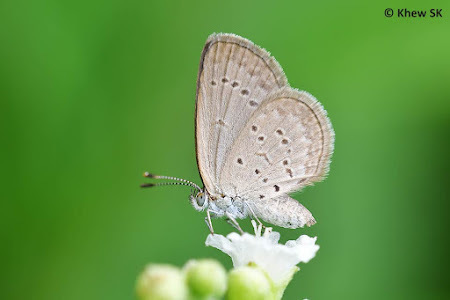 Often found in urban gardens at open fields and grassy areas, the Lesser Grass Blue flies erratically usually no more than a few centimetres above the ground. 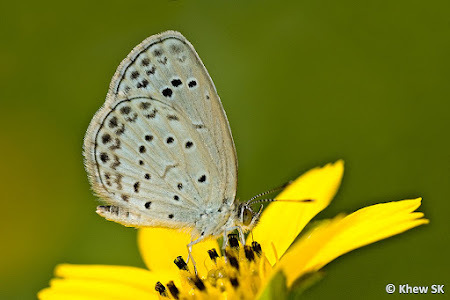 Occasionally, they can be abundant, fluttering and chasing each other amongst the grasses and wildflowers in open wastelands and roadside verges. 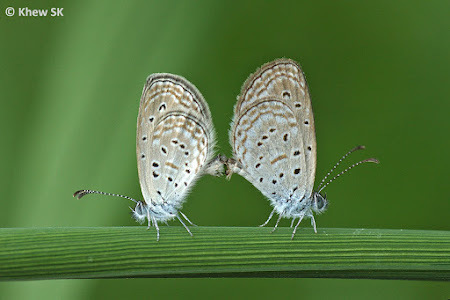 With an average wingspan of no more than 18-20mm, the Lesser Grass Blue is a dull purplish blue with broad diffuse black borders in the male. 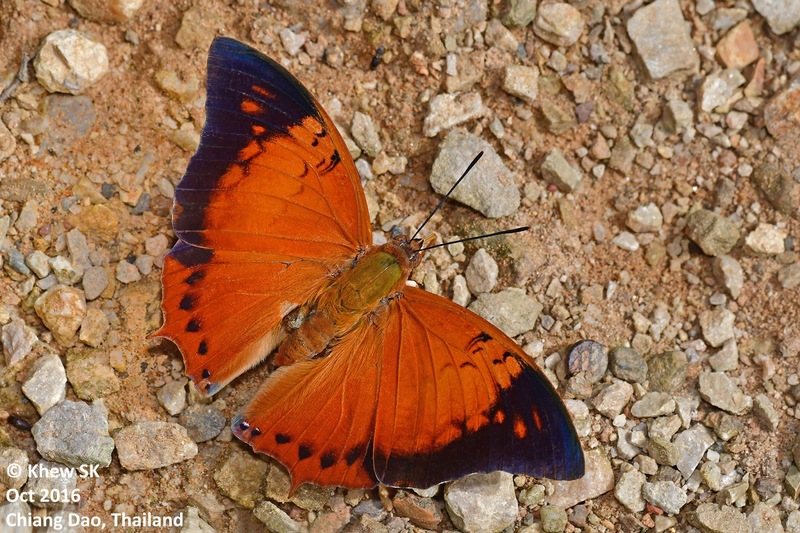 The female is predominantly brown and unmarked above. 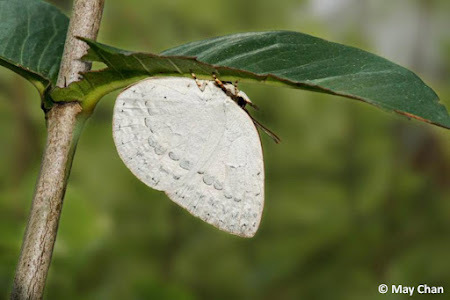 The underside is a pale ochreous grey with small dark spots on both wings. 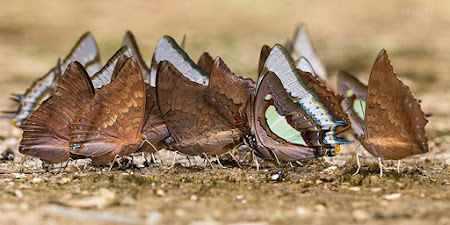 The distinguishing feature of this species that separates it from its lookalike cousins is the spot in space 6 of the hindwing. 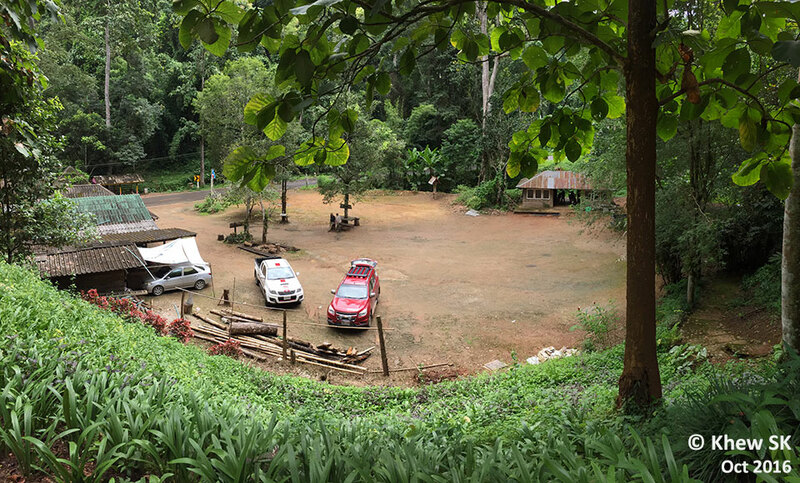 This spot is moved out of line with the adjacent spots. The submarginal markings on both wings are typically diffuse and indistinct. 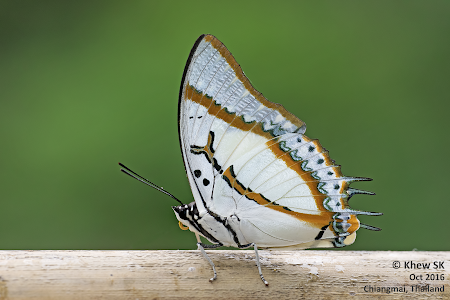 On the underside of the forewing, the spot in space 11 is absent. 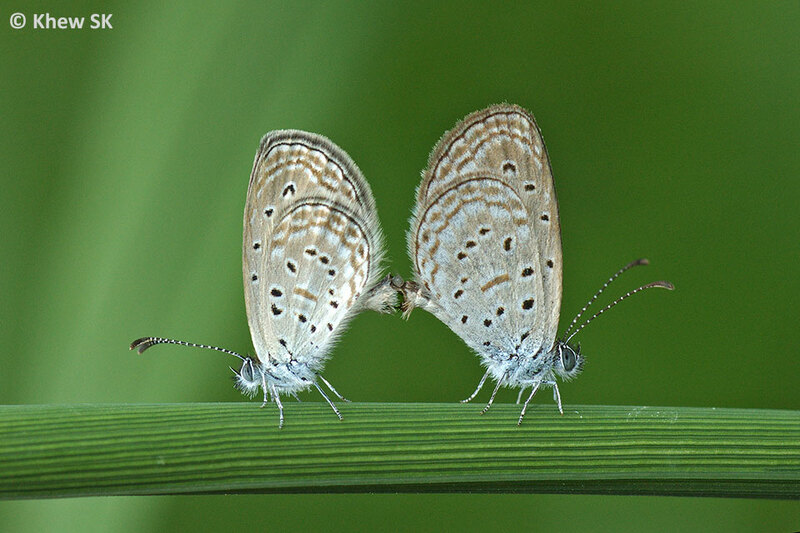 The second species of Grass Blue found in Singapore is the Pygmy Grass Blue (Zizula hylax pygmaea). 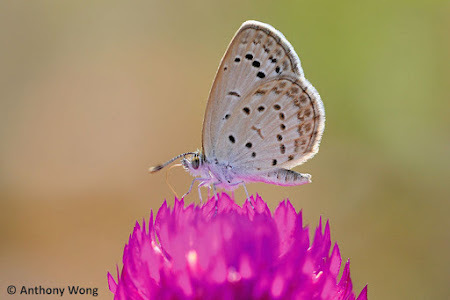 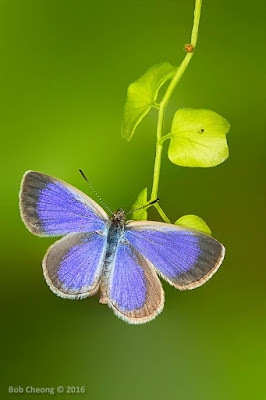 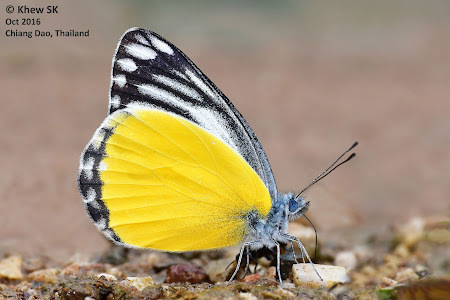 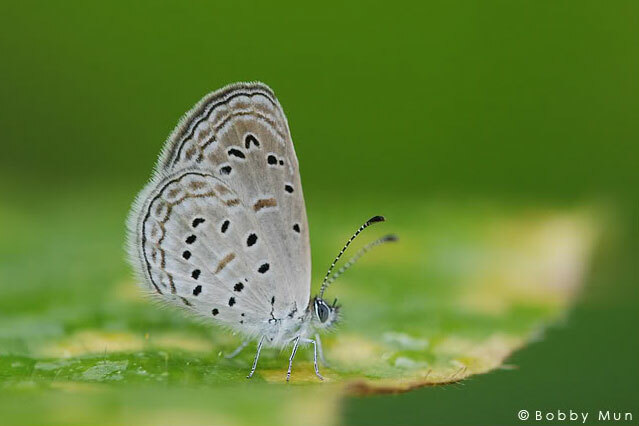 Also known as the Tiny Grass Blue in other countries, this species is considered the smallest butterfly in Malaysia and Singapore. 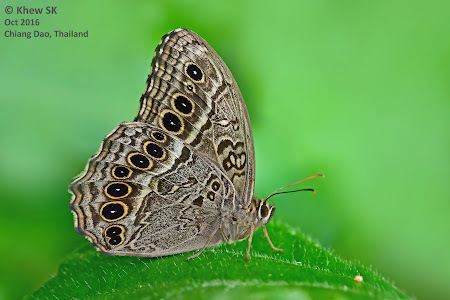 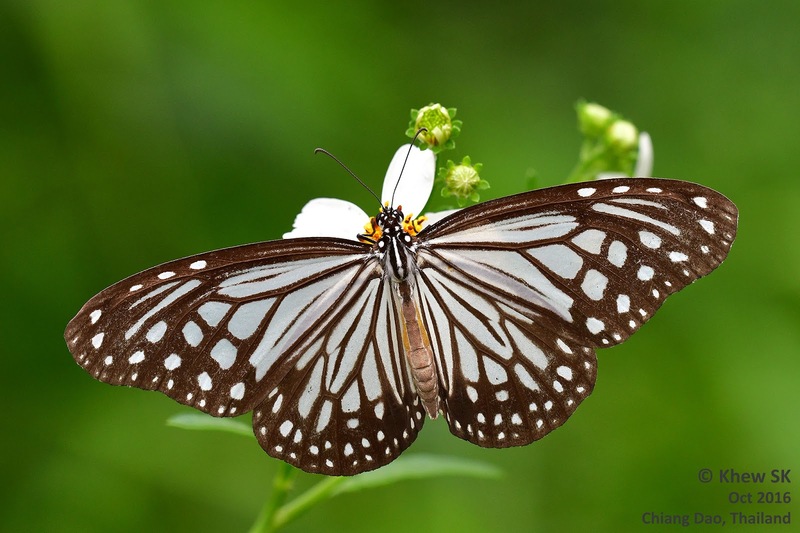 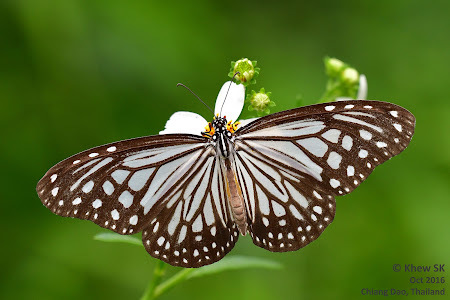 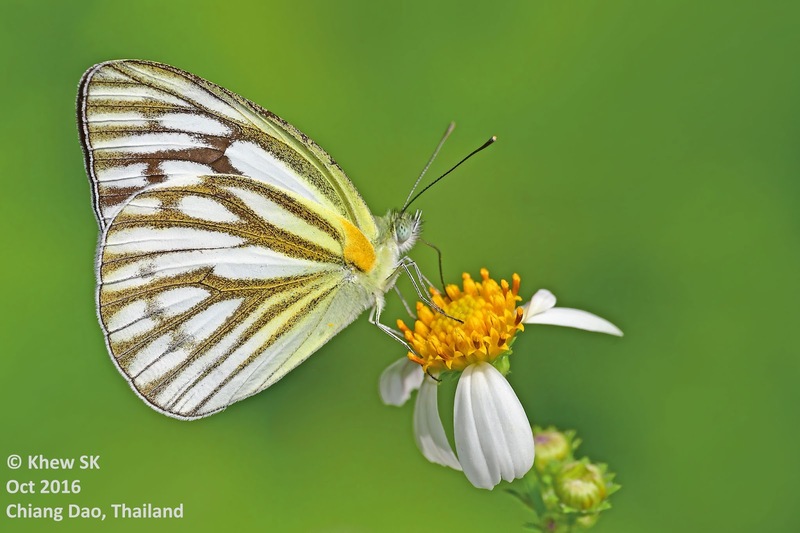 With a wingspan of only about 14-16mm, this small butterfly is often missed by observers. Like its related cousins, the Pygmy Grass Blue flies amongst shrubbery in urban gardens and is sometimes abundant. A favourite is the Prickly Lantana (Lantana camara), where this diminutive butterfly is observed ovipositing on the young buds of the flower. 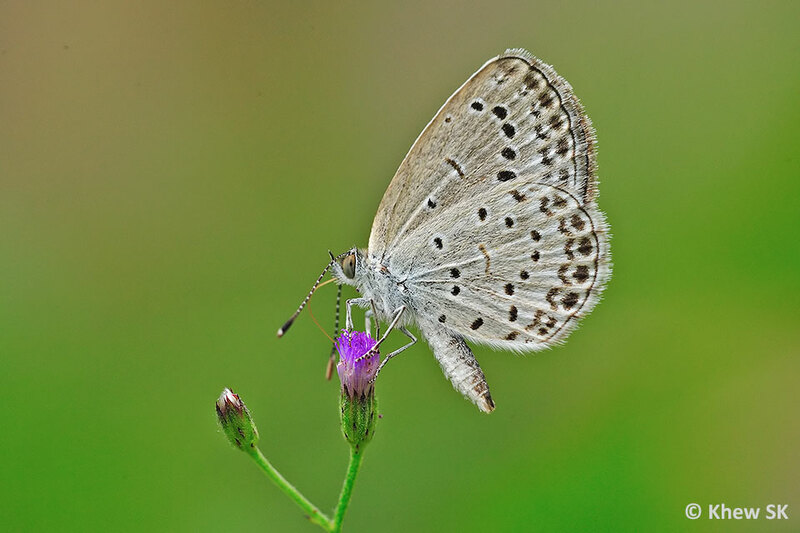 Other caterpillar host plants that have been recorded are Mimosa pudica, Ruellia repens and Desmodium triflorum. The male is a dull blue above and unmarked. 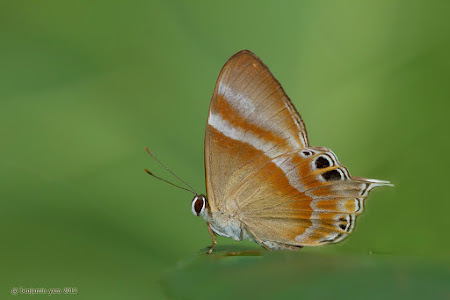 The female is dark brown. The underside is greyish white with the usual black spots on both wings, and a paler series of submarginal markings. The subapical spot on the underside of the forewing is typically "V" shaped, whilst the post-discal spots on the underside of the hindwing are aligned. 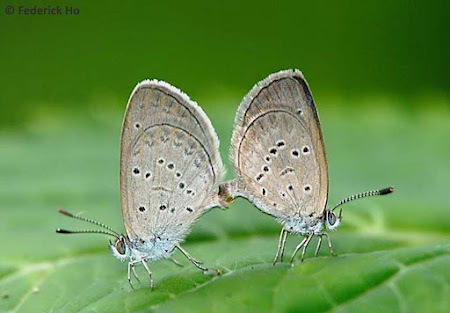 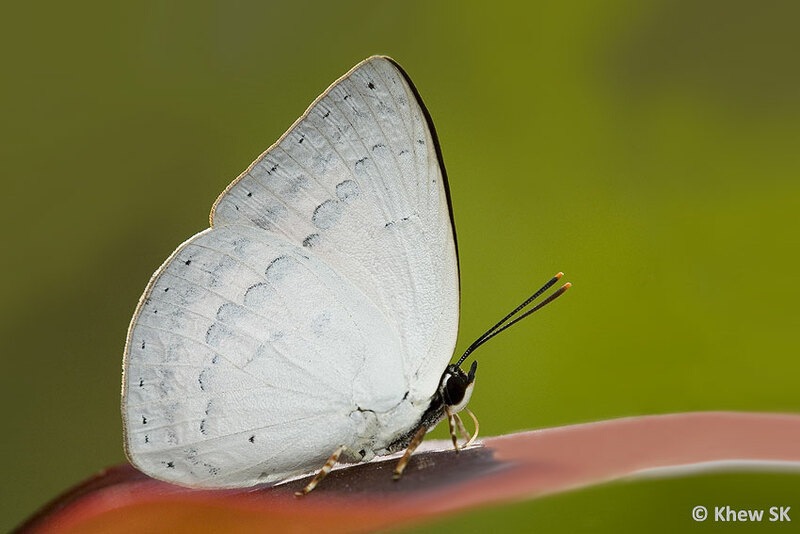 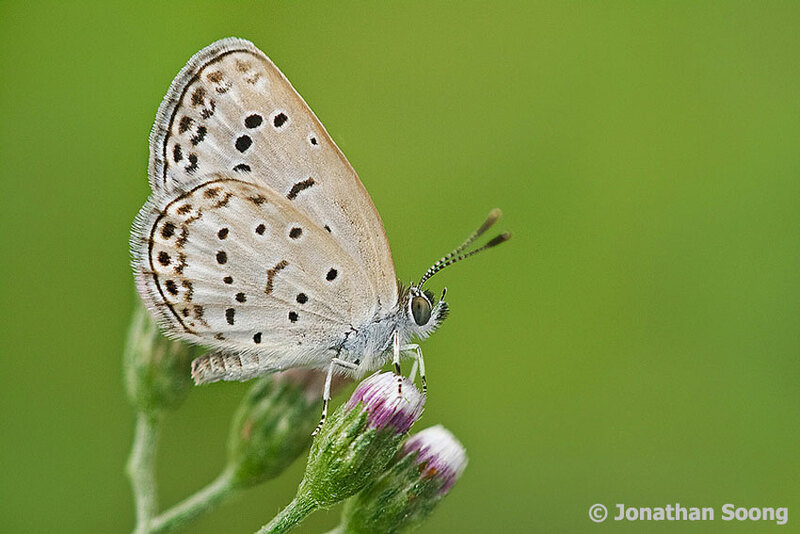 The third and final species of Singapore's Grass Blues is the Pale Grass Blue (Zizeeria maha serica). 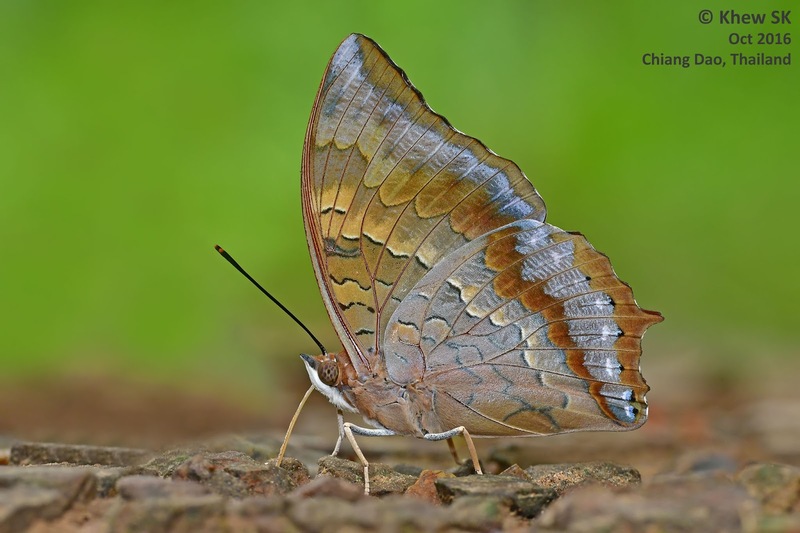 This species is a new record for Singapore when it was first found in 2001. 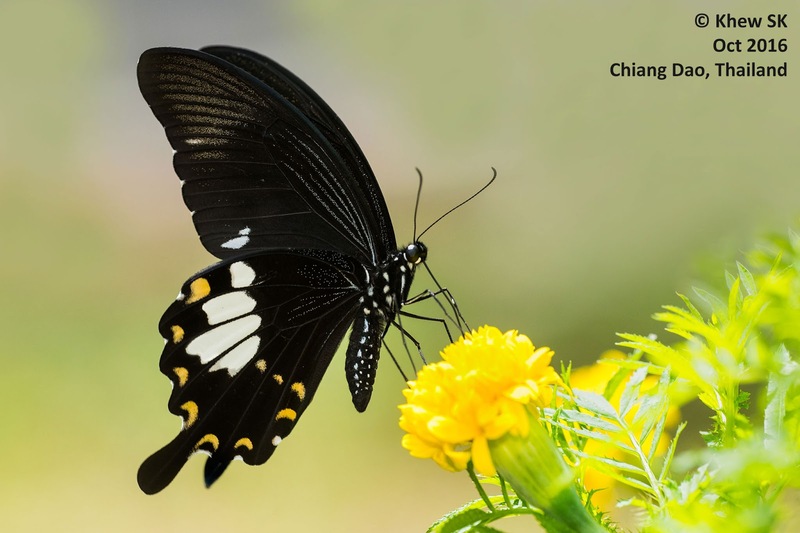 It was never listed in the early authors' checklists and may likely to have been accidentally introduced to Singapore. 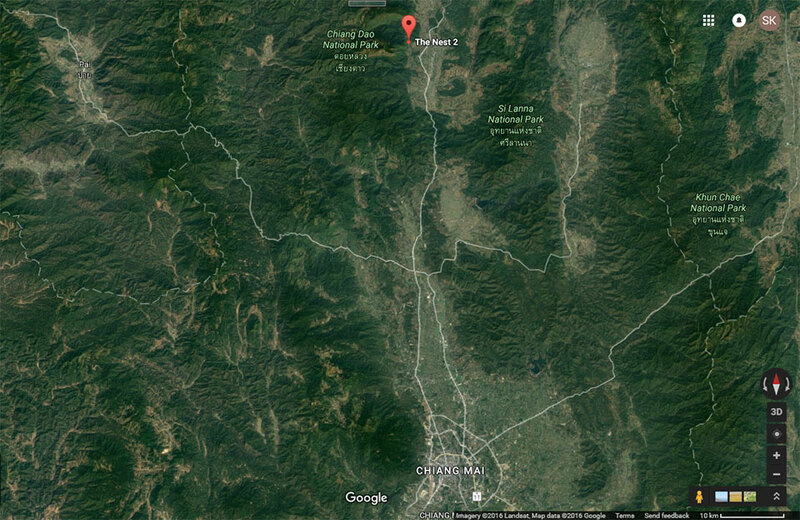 Photos of specimens sent to the late Col JN Eliot confirmed that this was subspecies serica. 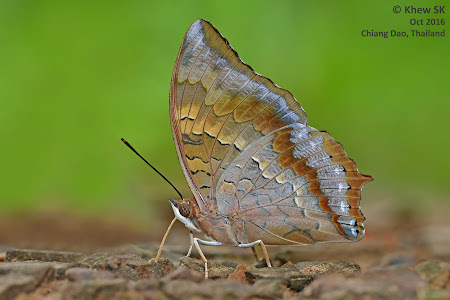 Col Eliot opined that this species is similar to the type species that originates from Hong Kong. 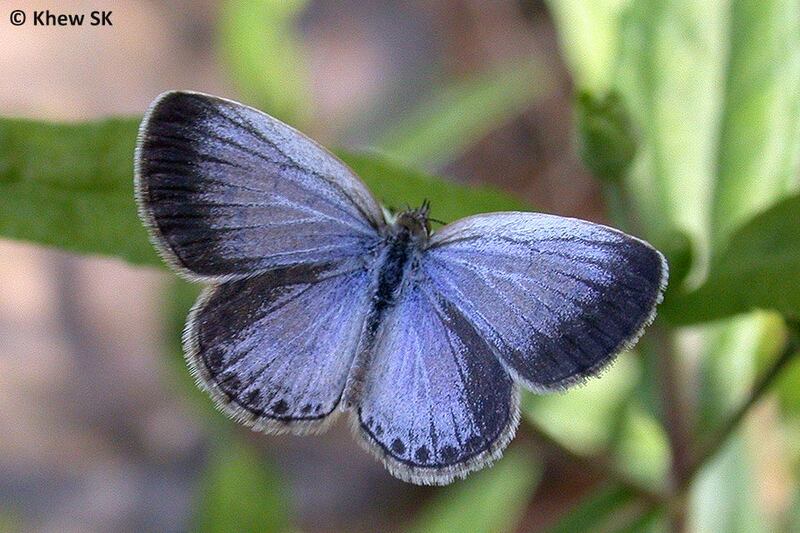 The Pale Grass Blue is light blue above, with broad diffuse dark borders. 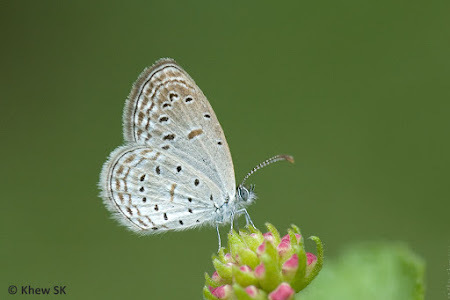 The female is a dark greyish blue. 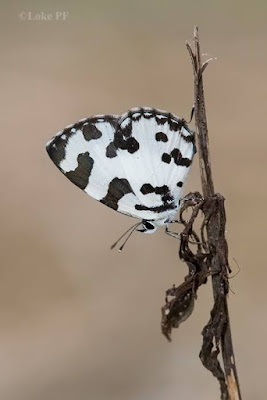 The submarginal markings are distinct and dark. 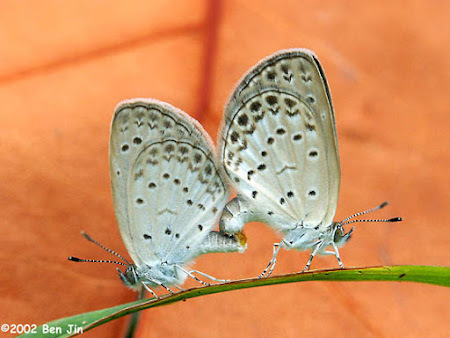 On the underside of the forewing, the post discal spots are large, round and distinct. The post-discal spots on the underside of the hindwing are aligned. 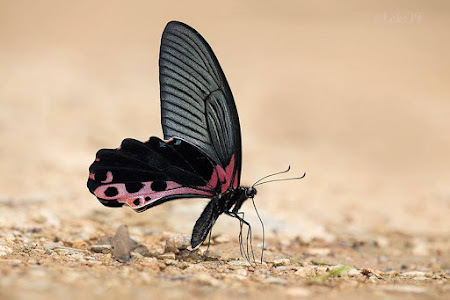 There is also no spot in space 11 on the underside of the forewing. 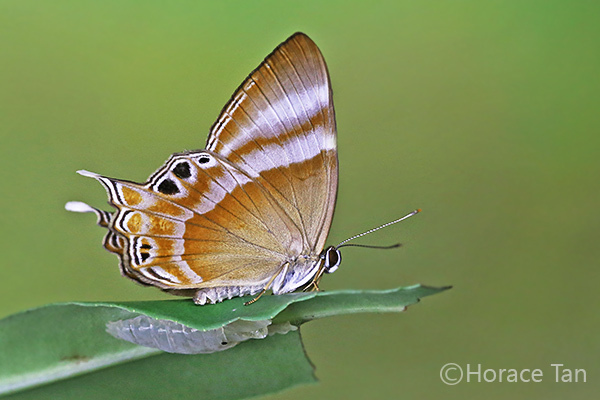 It is interesting that the Pale Grass Blue (Zizeeria maha serica) has replaced the other species in the genus, the Dark Grass Blue (Zizeeria karsandra) in Singapore. Although the Dark Grass Blue has been recorded in Singapore before, no reliable sightings nor specimens have been found in recent years. 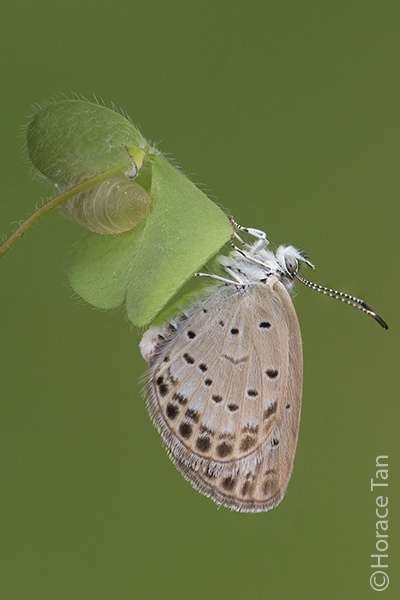 This species may have been overlooked by observers and darker individuals of the Grass Blues should be scrutinised closely to establish if it is indeed still extant in Singapore.